For the past 30 years, the cellular industry has been crisscrossing the US installing more than 350,000 cell sites in cities, towns and crossroads. Municipalities fortunate enough to have cellular sites located on their properties have been able to count on a steady stream of income from their cell site leases to address municipal financial needs. While these rents have been a nice source of revenue for municipalities, the ever-increasing challenges to municipal budgets and changes in the telecom industry have led many forward-thinking municipal leaders to seek strategies that multiply and maximize the value they receive from their cellular site leases and provide a much-needed windfall of available capital. 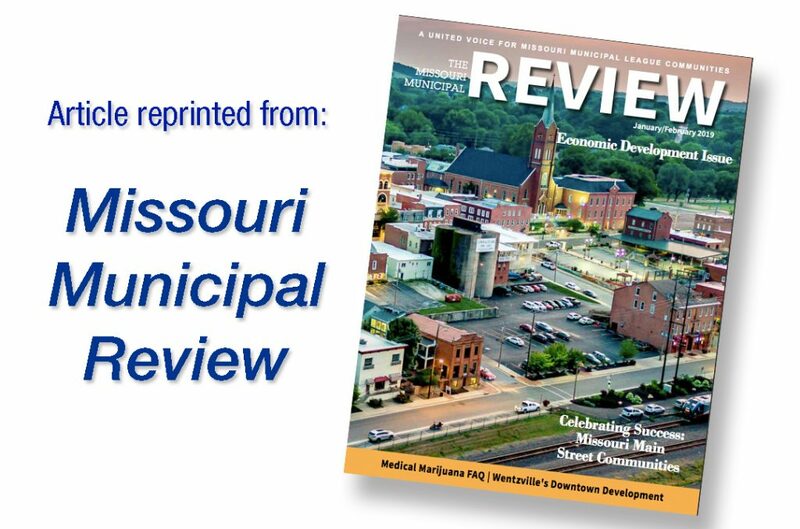 It’s not surprising that leaders in many municipalities are closely examining all of their potential revenue sources in the context of their short- and long-term needs, risks and how to best utilize their assets. Until recently, the union between municipalities and telecoms has been largely controlled by the telecommunication companies. Municipalities give them access to place their towers and antenna on publicly owned property in exchange for long-term leases with monthly rent payments. Unfortunately, many times municipalities were unable to negotiate the best terms for their leases and consequently receive lower-than-market value payments for extended periods of time. To make the situation even more one sided is the fact that many of these leases carry early termination clauses that allow the telecom to walk away from the lease with little notice or recourse for the municipality. Moving forward, the telecom world is going to be adapting and changing like never before. Mergers, new technologies and the push for higher profitability will put added pricing pressure on both new and old cellular leases. The coming rollout of 5G cellular and the small cell technology that drives it is going to have a gigantic impact on cell site values over the next several years. Overall 5G technology will make it possible to move more data faster and with less power enabling smart homes, smarter cities, self-driving autos and many other Internet of things technologies. The good news is that this will require a tremendous investment in new cellular sites and equipment to provide the coverage necessary to enable the lower frequencies that power 5G. Some of this income will go toward adding additional equipment and upgrades to existing towers, which should bring additional income to some cell site owners. It is expected that a great portion of 5G investment will be in small cell sites. The antennas utilized in small cell technology can be as small as a rural home mailbox and can be sited on existing light poles, buildings or highway overpasses. For cell site owners, the bad news is that small cell technology will require less large cell tower sites, which may mean some site owners will have their sites decommissioned and their leases cancelled, often with little or no notice. Rents from small cell sites will be significantly lower than those for larger towers. In fact, many state governments, including Missouri, have passed bills that will legislate lower rents on small cell antennas. With these lower site costs, it is expected that telecoms will force some current tower owners to renegotiate their existing leases or face the possibility of having their tower replaced and decommissioned. After considering the opportunities and challenges facing today’s municipalities, it’s not surprising that many municipal leaders have determined that now is the time to pursue a cash or structured buyout for their cellular ground leases. 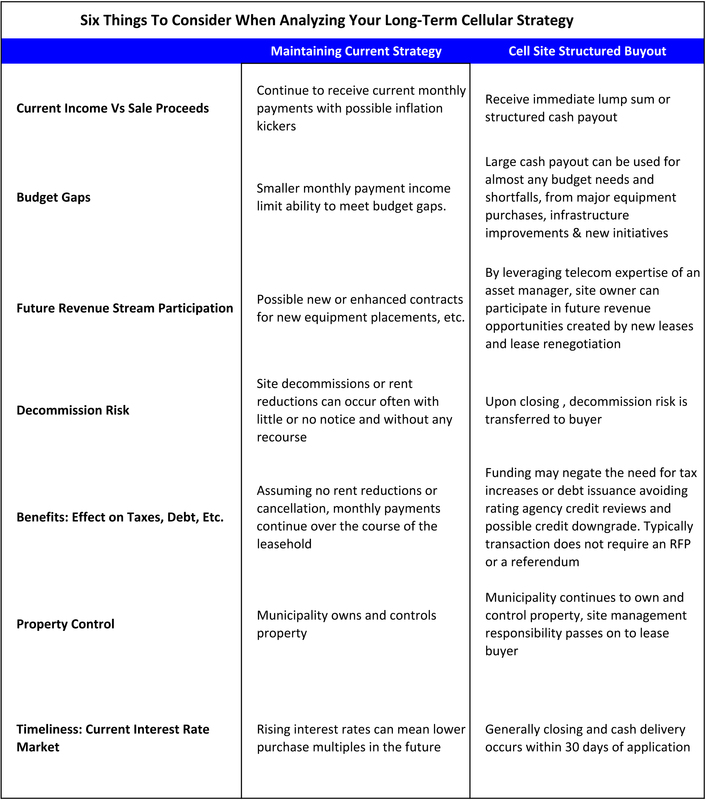 Converting their smaller monthly lease payments into a large cash payout provides greater financial flexibility and control for municipalities without the constraints of other means of obtaining capital. It also eliminates the risk of future rent decreases or site decommissions. Currently, cellular lease buyout prices are at all time highs. But with the ongoing rise of interest rates, looming merger and technology threats and the increasing likelihood of future lower rents or cancellations, these high prices possibly will be short lived. Municipalities who are considering new strategies to maximize the value of their cellular assets would be advised to begin their due diligence process before market forces reduce the value of these assets. Kenneth Saverin is the CEO of Crescendo Capital Partners, LLC a leading ground lease optimization and acquisition firm. He has more than 30 years experience in investing, real estate and innovating products that provide capital opportunities and access for both public and private clients. His experience as an attorney and an investment banker provide him with unique expertise to work within the legal and regulatory environment of municipalities to structure custom strategies and solutions to help maximize the value of their cellular assets to address municipal financial needs. For more information about how you can maximize the potential in your cellular ground leases, contact Crescendo at: info@crescendotrust.com or 203.972.3200. Visit www.crescendotrust.com.